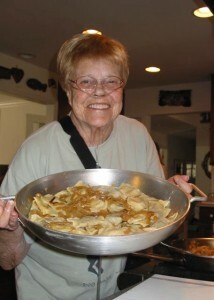 Mom and the big pan of Pierogis we just finished making! We all have triggers. They can be aromas that remind us of days gone by. Like the smell of onions and garlic cooking that sends me to the times when Bill, my mother, and anyone else who wanted to take part, came into my kitchen and helped me prepare our best-loved food, pierogis. This traditional Polish dish of pockets of dough stuffed with delicious fillings has always been a part of our holiday celebrations. My favorites are the sauerkraut ones, with caraway seeds, and lightly caramelized onions. There were also those stuffed with mushrooms sautéed in butter with loads of garlic. The smell of watermelon can also set off visual memories of the days in my youth when I lived on the shore of Long Island Sound. My free time was taken up with swimming, waterskiing, digging clams for supper, and the gritty feel of sand in my shoes. Calendars can be triggers as well. The dates when loved ones passed away can set off another round of grieving for our loss, disconnecting us from holiday cheer or a season like spring, when everything is supposed to come back to life again. 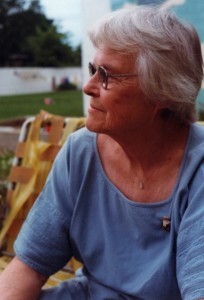 Mom in 1997 before she became very ill. I am sometimes triggered by seeing people who look like my mother, father, or the brother I lost six years ago. There is an advertisement for a senior community on a local tv station, in which a lovely gray haired woman is looking happy and reading a book as she sits in a rocking chair. She looks just like my mother before her health started to fail. Every time I see it I feel sad wishing I could go back in time and change the way things turned out for her. But alas, none of us has the power to do that. Words can also set me off — like hysterical. The Cambridge Dictionaries Online says hysterical is the inability “to control your emotional behavior because you are very frightened, excited, etc.” It can be uncontrollable laughter or the shock and grief you feel when when you learn of someone’s death. In the old days the word was defined as a neurotic condition, especially of women, caused by a dysfunction of the uterus. Whenever a woman became upset and cried, she was said to be suffering from hysteria. Many a woman found herself admitted to hospital and stayed there because she was too emotional. Wouldn’t most people cry when they’re told that a loved one has a terminal illness? My reaction to those comments of hers always made me angry. I felt shushed — as though my feelings were stupid and didn’t matter. I may be an emotional woman, but I do not suffer from hysteria. My mother was also an emotional woman. She had been abused as a child and lived with my father’s PTSD for over the forty plus years of their marriage. But she never cried in public or admitted a hurt. She hid her sorrow, grief, and pain from herself as well as onlookers. She self-medicated with alcohol which released her emotions in the form of anger. Using booze, she was able to let go of her pain for a while. But it always came back and the cycle of drinking began again. Though I use the word hysteria and can laugh hysterically, almost wetting my pants at times, I still occasionally have trouble with both words. They can come out of the blue in innocent conversations and hit me hard. Just like the way the smell of onions and garlic sautéing can get my stomach rumbling, those simple words can make me feel stupid and unimportant. Awareness of those triggers helps me overcome emotional reactions. When a word sets me off I pause, remembering it is just a word and has nothing to do with the present and its context that I carried with me over the years. I can let it go and move on. Do you have words or other things that can trigger reactions? How do you handle them? 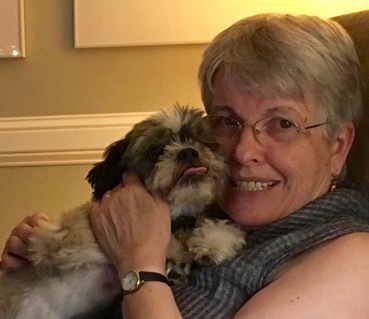 Read about my relationship with my mother in my memoir, Scattering Ashes, A Memoir of Letting Go, due out in September. It is available for pre-order on both Amazon and Barnes & Noble. Sifting through our possessions now, I find triggers: more letters from Mom, old photos. Yesterday Cliff found a lovely line drawing he did of my Grandma Longenecker posing in her rocking chair. I teared up and walked away momentarily, filled with overwhelm, appreciation, and love. Oh yes, Marian. Moving and finding those gems does it very easily. Be careful of what you discard through the process. Those letters and the drawing are priceless things that will one day be appreciated by your grandchildren. Moving is hard and when you’ve been in a home as long as you have it must be even more difficult. Photos and drawings will travel with us. Joan, the aroma of food and listening to music from the different eras bring me right back to specific memories of people and places. My Italian grandmother, Nan, used to make the most delicious Easter bread (called palome). One of my cousins has the recipe and makes it every year. If I get anywhere near it, my mind and heart are flooded with memories of her rolling our the dough at the kitchen table while whistling toothless tunes, then placing all the loaves on her bed until she distributed them to the family and neighbors.. She ended up sleeping on her couch during this time! I can also taste it..the sweet taste of home. Lovely post. Thank you for a trip down memory lane. I’m so glad my post brought you very fond memories. Your grandmother sounds like a wonderful person, giving of herself in so many ways. I love your story. Thanks, Laurie. I believe it’s the only way to handle it. My mother also self medicated with alcohol and my father used her as a punching bag. Cancer put her out of her misery. My teachers and friends saved my life. Thank you. Francine, It seems we have a lot in common. My mother also had lung cancer from her smoking. Teachers and friends are wonderful in how they help us when we’re down. “There’s the respect that makes calamity of so long life”. I do not have such courage. Shakespeare did help a lot. I’m not sure the sea of troubles will ever end. But by balancing them out with a sea of joy they are not as troublesome. Its so hard to be a sensitive person living with parents who have their own trauma and emotional issues. Thanks so much, Val. There is also joy and remembering the good times. That is what balances it all out. Compassion: “To understand is to forgive.” I see the stress of poverty and how trauma and emotional issues are passed from generation to generation. I understand and I forgive. Carpe Diem. My husband and I both have begun to learn to work with triggers left by trauma and abuse. It’s a powerful tool and one that has made it possible to navigate treacherous ground together. You describe the dynamics so well and I could feel how hard it must have been for you. You are an incredibly strong woman, in large part because of your tears! I am most trigger by a look, a body movement, a sense that someone is indifferent. The first sip of an ice cold beer or Scotch (as I don’t drink them often anymore) sends me right back to my college/graduate school days. Thank you, Dorothy for your kind words. Bravo to you and your husband for learning to work through triggers that can make life so difficult. I can also be triggered by a look, especially the one my father used when he wasn’t happy with me. I think many of us became writers because we were unable or not allowed to show our tears, our laughter, or just speak our mind. I know that’s the case with me. Beautiful post. Keep on showing your emotions with your words. Pamela, Thank you so much for stopping by and adding your words to this discussion. Tears, laughter, and speaking our minds are all part of life and we must include each of them in daily doings.